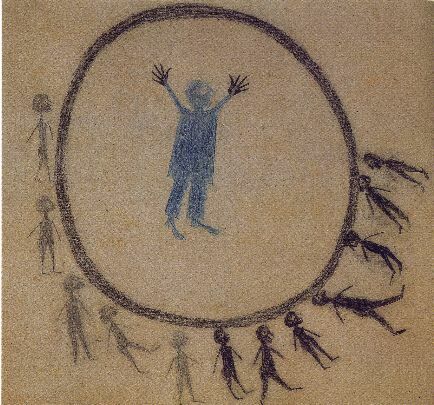 Bill Traylor was born a slave on the plantation of George Traylor in 1854 (like many slaves, he took the name of the owner of the plantation where he was born). He lived most of his life near Benton, Alabama, working as a field hand. In 1938, Traylor moved to Montgomery to work in a shoe factory. Soon thereafter, he became crippled by rheumatism and began receiving government welfare payments. At the age of eighty-five, Traylor began to draw, spending much of his time sitting outside a funeral parlor in Montgomery, using whatever materials were available. Traylor’s friend and fellow artist Charles Shannon provided him with both materials and encouragement. In three years, Traylor created a world of images, depicting scenes of rural farm life that embodied many of the black cultural experiences of the time; many of his drawings also featured animals that were part of his daily life. In 1942, he went to stay in several northern cities with his children, and during this period he did little, if any, drawing. In 1946, Traylor reappeared in Montgomery and began to draw again with the same frantic need. He died the following year in a nursing home.